Depth Control, which we’ve featured in the video below, lets you adjust the amount of blurring in the background of your Portrait Mode images, giving you more control over how your images come out. Depth Control can be accessed after you take a Portrait Mode image by tapping on the “Edit” button of a Portrait Mode photo in the Photos app. At the bottom of the editing interface, you’ll see a new Depth slider, which is what you use to adjust the blurring or depth of field of the image. In a traditional camera, a larger aperture means more background blur and a shallower depth of field, while a smaller aperture results in less background blurring. This system is what Apple is mimicking with Depth Control. If you’re new to photography, it’s a bit confusing, but a larger aperture is represented by a smaller number, while a smaller aperture is represented by a larger number. So in the Depth Control slider, which ranges from f/1.4 to f/16, f/1.4 is the maximum amount of blur while f/16 essentially eliminates all background blur for an image that’s sharp throughout. By default, all Portrait Mode images on iPhone XS and XS Max start at f/4.5, and from there, you can move the slider along the bottom to the left or the right to add more or less background blur. Being able to adjust the depth of field is useful because you can tweak exactly what you want blurred, and it can save some photos that otherwise would have had key details (like the edges of hair or fur) blurred out by Apple’s Portrait Mode software. Depth Control is limited to Portrait Mode images taken with the front or rear-facing cameras because there needs to be blur to adjust in the image. 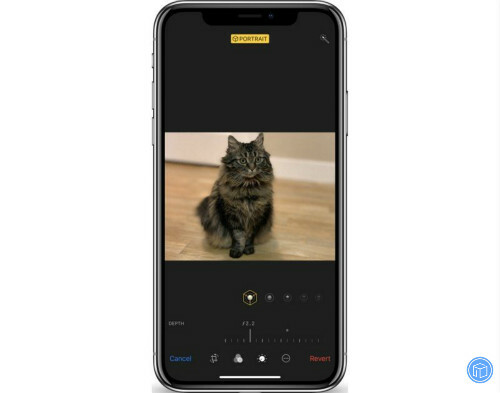 Right now, editing the depth of a photo is limited to images that have already been captured, but starting in iOS 12.1, it will work in real time too. In the iOS 12.1 beta, when capturing a Portrait Mode image with the front or rear facing camera, you can tap on the little “F” in the upper right hand corner of the display to access the Depth Control slider to see how more or less background blur looks in real time before taking an image. The camera app will also remember your preferred Depth Control settings from photo to photo, so you can always set it at the depth of field that you like best. Live Depth Control lets you get the perfect angle and the perfect amount of depth for the portrait that you want to capture so you can make all of your real-time adjustments before snapping the photo. What do you think of the Depth Control feature in the iPhone XS and XS Max? Let us know in the comments.